The hunter 53091 builder collection 52" indoor ceiling fan (with fan & light pull chain control and light) in new bronze uses incandescent light output and brings traditional style. 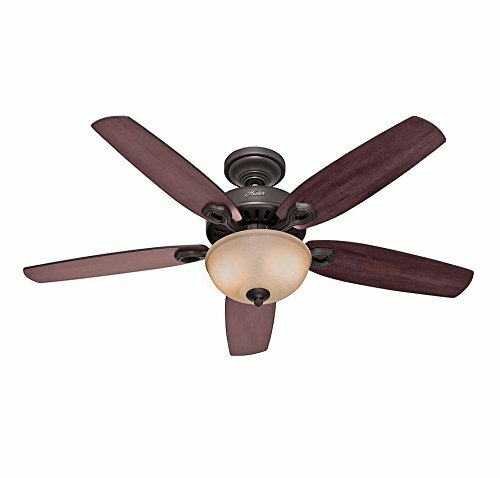 This fan includes five reversible Brazilian cherry/stained oak blades (same color, different grain pattern) and the hanging height is 17.9". The voltage is 120 volts. The hunter 53091 down light requires 2 bulbs (included). Additional information: Control - three-speed pull chain and on/off light pull chain with manual reverse switch on motor, down rod - includes 3" (3/4" interior diameter) pole, glass - toffee glass. Whisper wind motor delivers ultra-powerful air movement with whisper-quiet performance so you get the cooling power you want without the noise you don't.